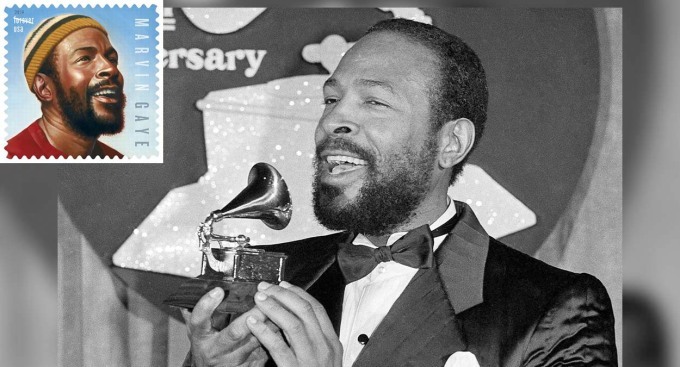 In this Feb. 24, 1983, file photo, Marvin Gaye appears with his Grammy Award after he was named top Rhythm & Blues Male Vocalist at the 25th annual Grammy Awards presentation in Los Angeles. Inset, a stamp released as a tribute to the late music star is pictured. A commemorative stamp featuring late soul singer Marvin Gaye was officially released at a first-day-of-issue event honoring the "Prince of Soul" and celebrating his music at Los Angeles' Greek Theatre. Gaye would have turned 80 Tuesday. His friend and fellow singer-songwrite Smokey Robinson was among the speakers at Tuesday's midday event. He said the stamp is just another way that Gaye, shot and killed by his father in 1984, lives on in the hearts of his fans. "I can put your picture on an envelope and let it fly around the world," Robinson said, fluttering his hands in the air. "I am really happy about that. It's so deserved. "I'm very proud that the world is still embracing Marvin Gaye. He will live on." The stamp is part of the Postal Service's Music Icons series. Its design features a portrait of Gaye inspired by historic photographs. The stamp pane is designed to resemble a vintage 45 rpm record sleeve. One side of the pane includes the stamps, brief text about Gaye's legacy, and the image of a sliver of a record seeming to peek out the top of the sleeve. "The Postal Service is honored to recognize Marvin Gaye, the Motown legend, with a stamp on his birthday in this venue that held a special place in his heart," said Gary R. Barksdale, USPS chief postal inspector. "Known as the `Prince of Soul,' Gaye was a man whose timeless music was a true catalogue of human emotions that inspired, informed and entertained the world." Another portrait of Gaye, also inspired by historic photographs, appears on the reverse along with the Music Icons series logo. A pane is the unit into which a full press sheet is divided before sale at post offices. Because of solo hits such as "How Sweet It Is," "Ain't That Peculiar," "I Heard It Through the Grapevine" and his duet singles with such singers as Mary Wells and Tammi Terrell, Gaye was dubbed "The Prince of Motown" and "The Prince of Soul." Gaye won Grammys in 1983 for best male rhythm and blues vocal performance and best rhythm and blues instrumental performance for "Sexual Healing." Gaye was elected to the Rock & Roll Hall of Fame in 1987 and received a Grammy Lifetime Achievement Award in 1996. "His music was cathartic," biographer David Ritz said. "His songs were prayers, meditations, strategies for survival." A bill naming the post office at 3585 S. Vermont Ave. in South Los Angeles the Marvin Gaye Post Office was signed into law by President Donald Trump on July 24. Gaye was shot and killed by his father following an altercation after he intervened in an argument between his parents at their house in the West Adams District on April 1, 1984, one day before his 45th birthday. Then-Los Angeles County Superior Court Judge Ronald M. George, later chief justice of the California Supreme Court, agreed to grant the elder Gaye a plea bargain because of the amount of drugs in the younger Gaye's system and pictures of the elder Gaye's injuries during his final fight with his son. The elder Gaye pleaded no contest to a voluntary manslaughter charge and was sentenced by Judge Gordon Ringer to a six-year suspended sentence and five years of probation. He died in 1998 at the age of 84.